If you’re also utterly obsessed with the special prawns or signature satays at Philippe Chow you are not alone. The cult favorite amongst foodies, the fashion set and celebrities alike is a beloved NYC staple - and for good reason. The food is delicious and memorable every time. Now downtown dwellers have a reason to rejoice. 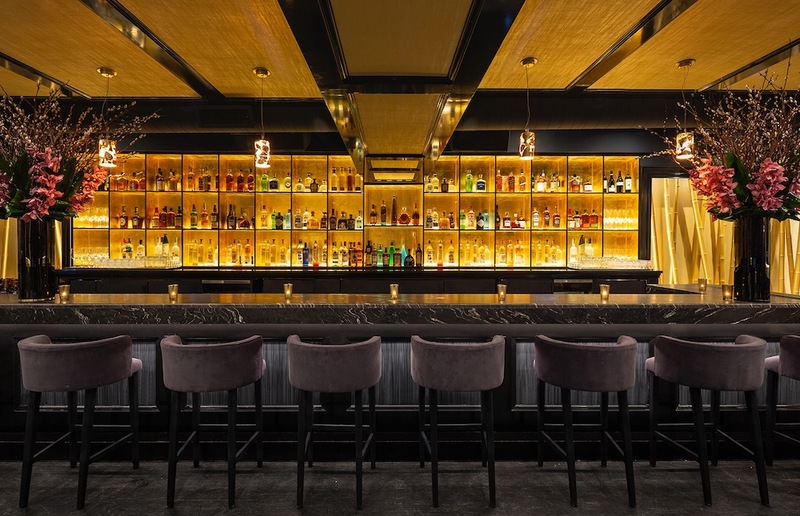 The renowned Beijing style restaurant has expanded its brand with the debut of a second location in New York within the Meatpacking District. Philippe Downtown is a subterranean dining space equipped with a late-night menu and service that will tailor to the evening crowd and neighborhood’s bustling atmosphere. Executive Chef Philippe Chow will continue to serve traditional Chinese cuisine to locals and visitors alike. Philippe Chow has gained its notoriety from well-known celebrities and influencers including Cardi B, Justin Bieber, and more. Philippe Downtown will feature the brand’s signature family-style menu that emphasizes traditional Beijing cuisine with an elevated twist. Open until 2:00am, the restaurant will cater to the late-night crowd, offering a modified menu available from Monday through Sunday beginning at 12:00am. Revelers will be able to enjoy their favorite dishes after dark, including Chicken Satay, Veggie Rolls, Sweet & Sour Chicken, and more. An ideal spot to continue the after party, Philippe Downtown will have rotating DJs that will add to the neighborhood’s effervescent nightclub and bar scene. “The Meatpacking District is the epicenter of New York City’s fashion and nightlife scene,” says Founder and CEO of Merchants Hospitality Abraham Merchant.“We have a consistent and long-standing clientele on the Upper East Side, but there is an undeniable energy downtown that we cannot wait to offer our guests - both old and new.” Designed by Corbin Plays, known for his work on Sean MacPherson’s properties, Philippe Downtown stays true to the brand’s signature, red, black and gold color scheme with modern elements. Pops of bold red can be seen throughout the space to symbolize good fortune and joy in Chinese culture. Simplistic yet flexible, the restaurant features multiple adjustable spaces and private dining options ideal for larger or intimate gatherings. Upon arrival, guests are greeted by a mirrored hallway with stairs that descend into the main dining room. The hallway is lit by delicate gold fixtures hung at different lengths. The main dining room features lacquer frame wood paneling, velvet banquettes and lounge seating accompanied by gold leaf ceilings and dark wood. Intricate pieces of artwork adorn the walls and backlit marble illuminates the space. Red drapes are discreetly positioned in the space that can be used to section off different areas for events. The main bar, located in the back of the dining area, includes a DJ booth encompassed with a gold bamboo display case for late-night events. 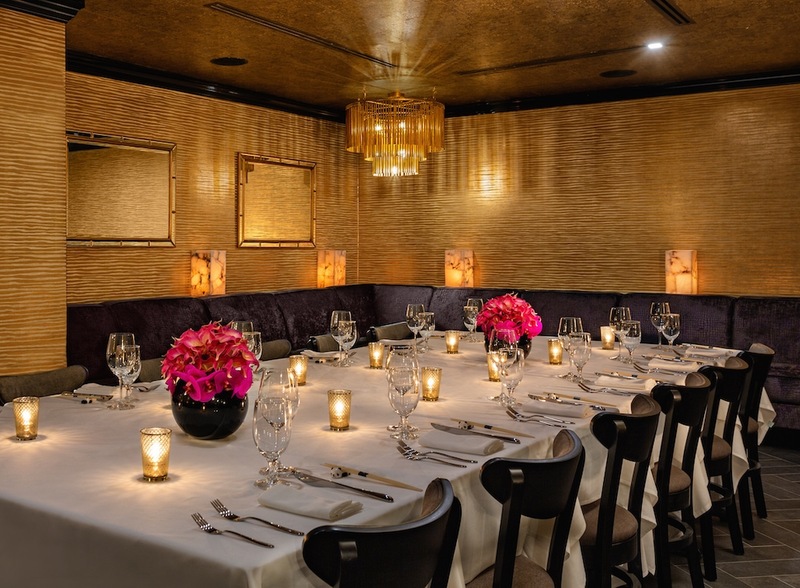 Philippe Downtown also features a private dining room that can accommodate up to 35 seated guests. The space includes a wooden partition for an added level of exclusivity. Herringbone ceramic tiling lines the space to create a natural separation from the main dining area.